My blog reader Kang Yong posted a comment after reading my previous post : nian gao 01. He enquired whether I really knew how to make nain gao. I am glad to say "Yes". 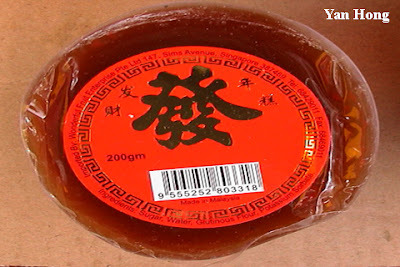 I still remember the ingredients, procedure and tools of making nian gao. With the urbanized of living environment and time factor, now people seldom make nian gao for themselves. They mostly buy ready made nian gao. Unless they are from kampung or new village and free to do so. Although steaming of nian gao can be done at the back lanes of terrace houses but it's inconvenient and not suitable. Besides that, grinding of the glutinous rice is a problem. It's not only takes time but also has to possess a grinder and to keep it. I didn't like to eat nian gao when I was small. As I grown up and getting older then I started to realize the meaning of eating nian gao and began to love it. If you're lucky, in major cities of Malaysia, you may find roadside hawkers peddling "nian gao" being sandwiched by one slice each of peeled sweet potato and yam, dipped in egg-flour mix and then deep fried in boiling oil, being sold as a local snack available nearly whole year round. Try it, if you haven't! That's a good idea, Sam. Thanks for sharing. This fried "nian gao" is available in PJ.